You might get heartburn after indulging in Mexican food, but you probably shouldn't blame the cilantro. The pungent leafy herb is added to a number of spicy dishes in a variety of cuisines to help temper the heat, according to the author of "The Herbal Kitchen." While it's possible that cilantro may be one of your trigger foods, it may also help prevent heartburn. If you're experiencing heartburn, consult your doctor to identify the underlying cause. Heartburn is common and occurs when the contents of your stomach regurgitate into your esophagus causing pain and discomfort. While spicy foods and eating portions that are too large are often the likely culprits of your heartburn, a number of common foods are also linked to the discomfort. These include fatty foods, citrus fruits and juice, tomatoes and tomato products, peppermint, spearmint and chocolate. 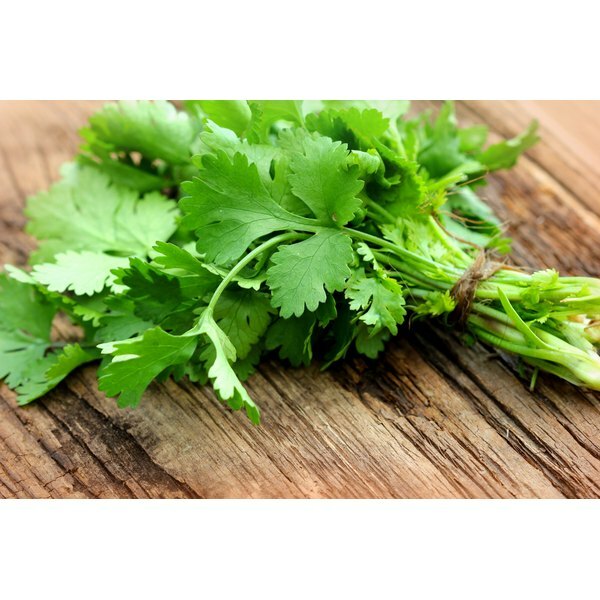 Cilantro is not a food commonly associated with heartburn, but that does not mean it may not cause trouble for you. Cilantro is considered a digestive aid, according to "Complementary and Alternative Medicine for Health Professionals: A Holistic Approach to Consumer Health." It may help relieve gas, bloating and indigestion. How it helps digestion is not explained, however. As an herb in your food, cilantro may also help balance spiciness, which may help improve tolerance. Is Cilantro Your Heartburn Trigger Food? If you're uncertain of the cause of your heartburn, you may need to experiment with different foods to identify the ones that cause trouble and eliminate them. You can do this by first omitting the foods that commonly cause heartburn, then experiment with the foods that you think may cause trouble, which may include cilantro. Record your intake and your symptoms and make adjustments to your diet as necessary. In addition to avoiding the troublesome foods, certain lifestyle changes may help you better manage your heartburn. Eating smaller meals and drinking between meals may help relieve some of the abdominal pressure. Also, Penn Medicine suggests you up your intake of fruits and veggies to get more fiber to prevent constipation. Staying upright for at least two hours after you eat and having your last meal three hours before you go to bed may also help.